MINISTERS last night crushed Remainers’ hopes of keeping Britain in the EU beyond March 2019 by announcing they will enshrine the time and date of Brexit in law. It will stop any backsliding on the timeframe for leaving the EU after growing calls to extend the Article 50 process beyond its current two-year cut-off. It kills off plots by business groups on both sides of the Channel. Only last night EU officials were floating the prospect of prolonging Britain’s EU membership beyond 2019 so Brexit negotiations carried on in to the two-year transition period. 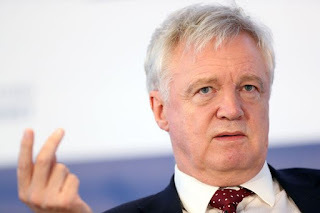 But Secretary David Davis quashed all speculation by unveiling an amendment to be attached to the crucial EU Withdrawal Bill that will “remove all doubt” that Britain is leaving the EU on March 29, 2019. He said it will give Brits, businesses and our trading partners “crystal clear” certainty over our future. And in another boost for Brexit supporters he announced that Britain will officially leave the EU an hour early – at 11pm GMT on March 29, 2019. It means Britain will quit exactly two years after Article 50 was triggered by Theresa May. By enshrining the exit date in law the Government turns up the pressure on Brussels to open talks on a future UK-EU trade deal. It strengthens Theresa May’s negotiating hand – and shows the EU she’s not bluffing with her threat to leave the EU in March 2019 even if we don’t get a deal. The move was recommended by veteran Labour MP and Brexit supporter Frank Field – but the Government will table it in its own amendment so it gains greater support from Tory MPs. The crucial bill, which hands the Government a swathe of powers to implement Brexit, returns to the Commons next week. If passed, it will make it almost impossible for MPs to extend Brexit negotiations and thereby delay our departure. A new vote in Parliament would be needed to overturn it. But Brussels yesterday warned that Britain must agree the details of a multi-billion divorce bill within the next two weeks if it wants to start trade talks at next month’s heads of state summit. Last night it was claimed that Mrs May is preparing to increase the amount of money Britain pays in its divorce bill – after leading Brexiteers in her party signalled they would tolerate a higher settlement if it helps get a better deal. She has currently only committed to around £18 billion – but could hike it when she meets for the crunch EU summit with her EU rivals next month. Next articleI’m a very very proud Biafran!